The perfect companion to your favorite lounge chair, our exclusive Appleton recliner table by OakRidge™ features a pull-out shelf for easy access to items while you're reclining and relaxing. 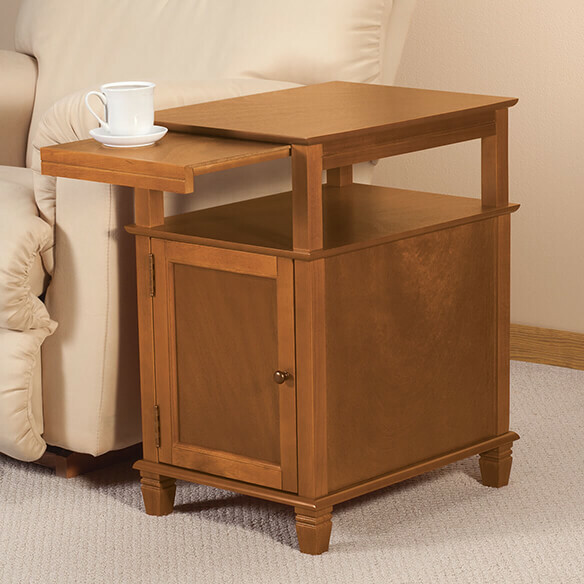 Stylish, high-quality OakRidge™ recliner side table features a cabinet with 2 shelves for discreet storage, an open shelf perfect for books and catalogs, and a versatile top surface with extendable slide-out shelf for remotes, snacks and more. At 19 1/4"L x 14 1/2"W x 24"H, the expanding table is ideal for small spaces. Choose from mahogany or honey to complement any home décor. MDF. Some assembly required. love this table i put it together myself.